Christian – Under the influence! We all have dreams that we wish would come true. Sometimes we make a wish and that wish is granted but what we actually get may be the result of how we have made that wish. If we make a detrimental wish against someone or something that wish becomes a curse. Sometimes unforeseen consequences may be unleashed that affect others who have to pay some kind of a price even though they were not the ones who did the wishing. The following is a retelling of a folktale called The Seven Ravens and explores how wishes are made and how they are fulfilled and what can happen when wishes are made in haste or anger. It appeared in Household Tales by Brothers Grimm by Jacob Grimm and Wilhelm Grimm and is classed as Aarne-Thompson type 451, The Brothers Who Were Turned into Birds tale type. Similar tale-types are found throughout Europe and other parts of the world. It has a female protagonist who sets out to rescue her brothers who were inadvertently turned into ravens by their father in anger. Other tales with similar themes and a female protagonist are The Twelve Brothers, Brother and Sister, and The Six Swans. This story begins with an old married couple who had seven sons. Although the old man loved each son dearly he still he wished for a daughter. After many years his wife again fell with child and to the great joy of the old man a baby girl was born but she was a very small and very weak and prone to illness and he thought she might die. On account of this he decided to baptize her and told one of his sons to run to a nearby well and bring back water for the task. His six brothers all ran with him for they were all greatly excited by having a baby sister and each wanted to be the one to fill the jug. In the tussle that followed for the task the jug was dropped down the well and could not be retrieved. The boys were all aghast and stood staring at each other not knowing what to do. This both shocked and worried the girl who went to her parents and asked them if it was true she had brothers and wanted to know where they were now. Now that the truth was out her parents felt they could no longer keep secret what had happened to her brothers. They explained how her birth had innocently and unwittingly caused the sequence of events that had caused her father to curse her brothers and how they had been turned into ravens. Although they tried to reassure her by saying that it was the will of God and not her fault at all the news had a profound effect on her. She would have loved to have had brothers and was shocked to find out she had seven of them. Furthermore, she took it to herself that she had been the cause of their being turned to ravens and thereafter was constantly fretting and worrying about them. She felt a great sense of guilt and could not get them off of her mind. Secretly, she wished that she would find them and resolved to bring them home no matter what danger or hardship she had to face. Thanking the morning star she took the drumstick and carefully wrapped it up in cloth and placed it in her pocket and off she went to find the Glass Mountain. She walked and walked and walked and at last she came to the mountain but found the door shut. Thinking she would use the drumstick to open it she looked in her pocket but discovered it had gone. Greatly disappointed she sat down and thought about what to do. At last she made a decision. She wished to find her brother so much she took out a little knife she carried and despite the pain cut off one of her own fingers and tried it in the keyhole. To her delight and relief the door opened and she went inside. As soon as she entered a dwarf appeared who greeted her in friendly way asking what she sought. “I seek my seven brothers who are the seven ravens,” she told him. “The Raven lords are not at home at the moment but you can wait until they return,” the dwarf told her and led her to a chamber where a large table was placed in the middle. Then the dwarf busied himself bringing seven plates of food and seven goblets of wine which he told her were the raven lord’s dinner. The girl took a bite of food from each plate a sip of wine from each goblet but in the last she dropped the ring that had been her parent’s. When their sister heard this wish she was full of joy and stepped out from behind the door to the great surprise and delight of the ravens who were instantly returned to their human form again. Great was all of their joy and they went home to their parents and lived happily as a family together for the rest of their lives. It is indeed a curious tale but what does it all mean? There is a school of thought, but not universally accepted, that this type of tale maybe an echo from a time when young men and boys were called upon to serve their king and country. They were sent to fight an enemy and their sister’s desperately wanted to free them and return them to the family. One of the consequences of the draft was that females, although made the heirs to family fortunes or estates when their brothers never returned, were subject to greater degree of personal control and especially over who they married. Apart from sisterly love for her brother rescuing and returning them would also release her from this strict management of her life. The problem with this idea is that the conditions it springs from are not found in every country that the story appears in though it is possible it could have been transported either orally, or in written form and adapted. There are a number of common folklore motifs such as the old couple, seven brothers, there is the quest the girl embarks on, the Glass Mountain and human transformation to birds. There is also a Goldilocks-type scene where she eats food from the plates of the brothers while they are absent and the ring of her parents. All these and more are woven into several themes to create a story with hidden meaning some of which religious in nature. There is the importance of baptism that Christians believe washes away original sin. It is not only a symbolic burial and resurrection but also a supernatural transformation. Its purpose is not just to cleanse or purify but also symbolic of dying and rising in Christ and was necessary for the cleansing of original sin. This is why it is a common Christian practice to baptize children and babies though it can be done at anytime in life. It may be that the father believed that if his daughter died without baptism she would not receive these perceived benefits of it, which may explain his fear and urgency, but not excuse his anger and hasty wish. Curiously, despite the importance her father attached to it, we never learn if she was actually baptized but we are told she grew into a strong, healthy and beautiful girl. The thing about wishes is that although they can be beneficial they can also be dangerous when done in haste. The story begins with an old man wishing he had a baby daughter and eventually this wish is fulfilled. He then hastily wishes his sons were ravens and this wish is granted. However, because it was invoked in haste and anger it turned into a curse and his sons were transformed into what he wished for. Why did he wish they were ravens? It is not certain but one possible answer could lie in the story of Noah who sent out a raven first to see if the floods had abated and it did not return and like the raven the boys did not return. The girl, on learning of the fate of her brothers, though it could not have been any fault of her own, had experienced great, though unnecessary guilt at her father’s hasty wish. To a lesser extent her brother’s childish behaviour arguing about who would fill the jug with water for her baptism was also to blame, being the trigger for her father’s anger. On hearing the news she had seven brothers who had been turned to ravens at her birth the girl blamed her own entry into the world for an event she could have had no control over. To rid herself of the guilt she erroneously experienced, she wished to find and rescue her brothers and in the process of doing that wished entry into the Glass Mountain. Both these wishes were granted but not without a long arduous journey to the end of the world and the painful cost of her finger. As well as a physical transformation the seven brothers appear to have been elevated to lords, but despite this change in status they wished she would come and find them and take them home. That wish was granted and the story ends happily. 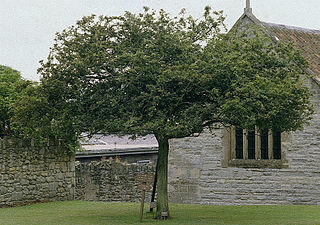 The legend of the Glastonbury Thorn belongs to the group of legends that surrounds Joseph of Arimathea and his legendary part in bringing Christianity to Britain. As with all legendary people there are many versions of his different exploits and achievements that cannot be verified. Such is the stuff of legends and the following has been pieced together from different sources. The Passion flower (Passiflora) is also known as Maypops, and in parts of South America, Maracuja. It is a plant of the Americas that was taken to Spain and later Europe and other parts of the world by early Spanish explorers and missionaries. In South America, early Catholic missionaries used parts of the flower’s anatomy as symbols representative of Christ’s suffering and from there it entered into folklore. The name relates to the Passion of Christ rather than having romantic connotations. Passiflora × belotii by Tomas Castelazo – Creative Commons Attribution-Share Alike 2.5 Generic license. One of the earliest known Europeans to encounter the flower was Nicolás Monardes (c1493 – 1588), a Spanish doctor in Peru in 1569. In 1745, Carl von Linné (c1707 – 1778) classified the plant recognising 22 species. The hybridization of the plant began in Victorian Britain and there are now believed to be more than 600 hybrids of the Passion flower around the world. It was the Europeans who noted that the plant had mild sedative properties and was beneficial in alleviating pain, nervous conditions and insomnia. However, it was in 1610 that Emmanuel de Villegas, a Mexican Augustan monk, seems to have been the first person to note, or record the symbolism attached to the plant’s anatomy and made sketches that were sent back to Europe. In early times because most people could not read or write, in Christian art and teaching, flowers were used as symbols representing profound metaphysical ideas and concepts to make it easier for the uneducated mass of people to understand. In some cases symbols were taken from the earlier pagan times before Christianity. The Passion flower became part of this tradition when it was adopted by early Catholic missionaries and brought back to Spain from the New World. Like the teachings of Christ, the Passion flower has spread around the world carrying the story of Calvary and the Christian message to people far and wide over many centuries. 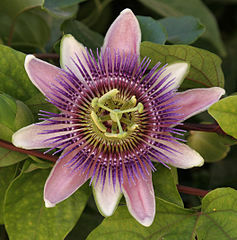 File:Flower jtca002.jpg From Wikimedia Commons - Passiflora × belotii by Tomas Castelazo - Creative Commons Attribution-Share Alike 2.5 Generic license.